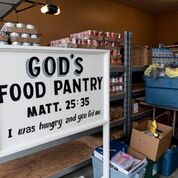 Holly Springs Baptist Church Broadway Community Food Pantry started in 2009 to fill the needs of our church community. It has grown into what it is today with the help of a lot of volunteers not only from HSBC but surrounding churches as well. Our mission is to always be here to fill the needs of our community. Give the Glory to God and “Do Good Because Good is Good”. 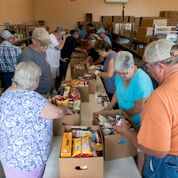 HSBC Broadway Community Food Pantry-Moses Farmer, Director-2017 begins the eighth year as a ministry serving the Western Harnett area. 2017 distribution dates: 2/20/2017; 5/22/2017; 8/21/2017; 11/20/2017; and 12/18/2017. 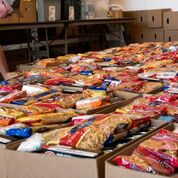 Assembling of food boxes will take place on Friday, 2/17/2017, 8am. Volunteers are needed, please.